They're prob'ly all in the post office. Some things never change. Did you receive the stuff I mailed to you early in the week? LOL. About 30 miles due west of me (just south of I-80 at York NE). Looks like what I'll guess to be a 12 T peeking out from behind the 2nd and 3rd cars from the left. Google Earth 400 Stanton Street. 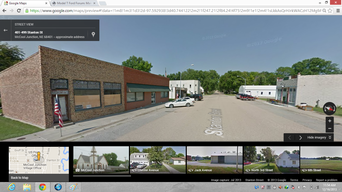 Two of the brick buildings are still there, and the tall one on the corner. 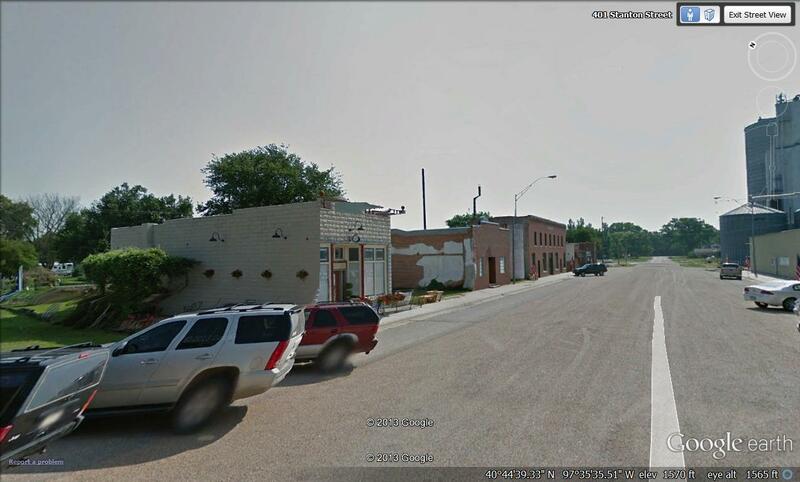 I don't know how to save the image from street view. Since it is a photo in Nebraska I thought a good title would be "Rob and the boys stop for cold one after harvesting"
Actually, in my youth I did have a few "refreshments" in McCool on occasion (and yes, those cars were about new then). 6th car from the left is a '14 T touring. 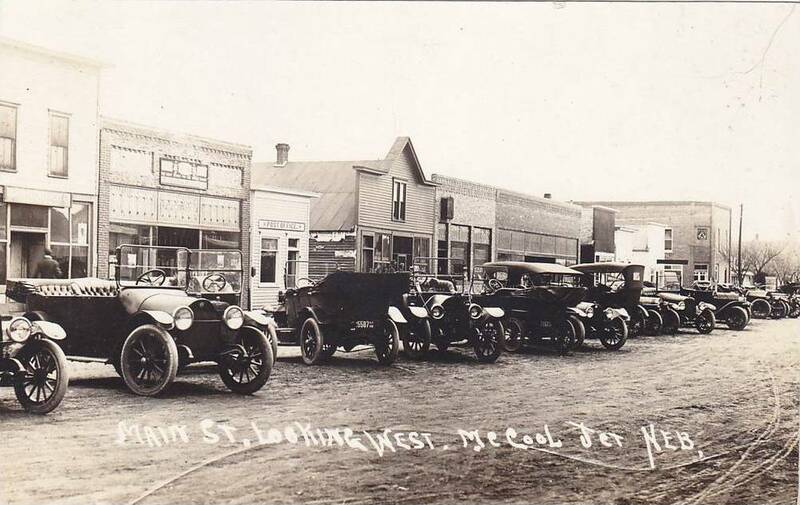 I see at least three Model T's. These old photos typically have white writing at the bottom. What was used to write on them creating this effect? The old photo albums used black paper and black corners to glue the pictures in. White ink was used in your fountain pen to write on the black paper, but some folks used it to write on the images too. I always thought that the writing like this was done on the negative? Royce and Herb both have good ideas on how the writing is done. My own opinion is if the writing is on the photo itself, it most likely was done on the negative. The white pen ws mostly used on the scrap book page. Any thoughts on how to confirm how it was done? I have an Kodak autograph model that has a small door on the back that lets you write on the film. If you write with a dark or black grease pencil on the negative after it is processed it will show white on the print. 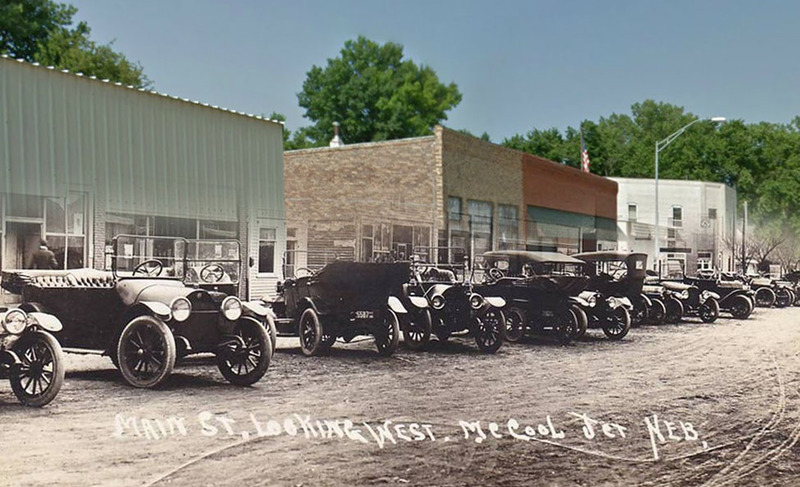 The "whole" touring car on the left above the words "MAIN ST." is a 1915 Studebaker.